Click to view and download 45-page guide. Family style dining is a meal service approach that early care and education programs implement to address childhood obesity prevention and support children in developmentally appropriate mealtime experiences. 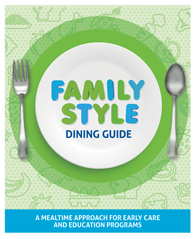 Click the links below to view and download the entire Family Style Dining Guide and support resources referenced in the guide. This guide is a companion to North Dakota’s Early Learning Standards. It offers practical ways parents, families, and early care and education (ECE) providers can promote healthy foods and eating experiences to children ages 2 to 5 years old. All information in this guide is based on current science, research and national best practices. Recipes and resources to support building healthy and budget-friendly meals. This guide can help you explore different fruits and vegetables throughout the year and take advantage of seasonal produce in your area . Children reach milestones in how they play, learn, speak, act, and move. Learn about milestones for each age and what to expect next. Visit our Resource Library to explore informative resources selected for you by Child Care Aware®.